EACH YEAR, I taste thousands of wines, either as samples that arrive in my office or at competitions in which I participate. Beginning in January, I taste with this list in mind, seeking out the most interesting offerings from our corner of the wine world. Some of these I tasted early in the year, and they stuck with me as extraordinary, for their clarity, style and purity of fruit. • My Wine of the Year for 2017 is a merlot, the same as last year (though a different producer). Maybe this is a signal that we need to pay attention to this often-maligned grape again. • You might look over this list and ask yourself why several obvious top wineries are missing. It’s as simple as this: I base this on the wines I taste under blind conditions, meaning I know neither the producer nor the price during the evaluation process. Some producers choose not to submit their wines and, well, I cannot recommend them if I haven’t tasted them. 1. Northstar 2014 Premier merlot, Columbia Valley, $85: This Walla Walla winery’s goal is to make the best merlot in the world. Winemaker Merf Merfield has crafted a good argument right here. Extraordinary now, and it will age well for decades. 2. DeLille Cellars 2014 Harrison Hill, Snipes Mountain, $90: Annually, I find this blend from a top Woodinville winery one of the most interesting wines in the state. This vintage was transcendent and was a whisker away from No. 1. 3. Mosquito Fleet Winery 2013 Reserve 34 cabernet sauvignon, Walla Walla Valley, $90: An extraordinary wine from a tiny producer in Belfair. 4. Fidelitas Wines 2014 malbec, Red Mountain, $40: Arguably Washington’s top malbec maker, Charlie Hoppes has crafted a red that is dark and brooding and is a great expression of the grape. 5. Tenet Wines 2014 GSM, Columbia Valley, $70: The most exciting wines in the Northwest are southern Rhone-style blends, and this Ste. Michelle collaboration with two French winemakers excels. 6. L’Ecole No. 41 2015 Seven Hills Vineyard GSM, Walla Walla Valley, $36: Winemaker Marty Clubb and Co. use estate grapes to craft an extraordinary blend. 7. Grantwood Winery 2015 cabernet sauvignon, Walla Walla Valley, $22: Winemaker/owner Joe Grant keeps producing delicious and affordable reds from this Walla Walla micro-producer. 8. Palencia Wine Company 2014 grenache, Yakima Valley, $36: Victor Palencia is arguably Washington’s biggest talent, and he proves it once again with this delicious red. 9. Thurston Wolfe Winery 2013 reserve petite sirah, Horse Heaven Hills, $25: Prosser winemaker Wade Wolfe is leading the charge with this Rhone red grape, and this example is nothing short of sublime. 10. Clearwater Canyon Cellars 2015 carménère, Horse Heaven Hills $32: Talented Lewiston winemaker Coco Umiker brings in this Bordeaux variety from Phinney Hill Vineyard and turns its grapes into one of Washington’s best wines. 11. Leonetti Cellar 2014 cabernet sauvignon, Walla Walla Valley, $65: The second-generation Walla Walla winemaker continues to make one of the state’s best and most-collectible wines. 12. Chester-Kidder 2014 Red Wine, Columbia Valley, $56: This cab-based blend is part of the Long Shadows project in Walla Walla. Thanks to the talents of winemaker Gilles Nicault, it is among the best in the state. 13. Columbia Crest 2015 Grand Estates syrah, Columbia Valley, $12: The Grand Estates tier has always resulted in great wines at astonishing prices, and this is no exception. 14. Maloney 2015 Phinney Hill cabernet sauvignon, Horse Heaven Hills, $50: Former Ste. Michelle red winemaker Josh Maloney makes one wine a year now, and this astonishing effort is among the best cabs I tasted in 2017. 15. Sequel 2014 syrah, Columbia Valley, $60: Aussie winemaker John Duvall (of Pensfold fame) is doing great things with Washington grapes under the Long Shadows umbrella. 16. Smasne Cellars 2012 Three Vineyard reserve malbec, Columbia Valley $45: Yakima Valley winemaker Robert Smasne continues to show off his deft touch with this favorite red Bordeaux variety. 17. Januik Winery 2014 Ciel Du Cheval Vineyard cabernet sauvignon, Red Mountain, $45: This is the result of one of the state’s great vineyards in the hands of our state’s top winemakers. 18. Mercer Estates 2014 reserve cabernet sauvignon, Horse Heaven Hills, $42: This longtime farming family grows a lot of cab for Ste. Michelle and makes superb wines under its own label in Prosser. 19. Wautoma Wines 2014 Stone Tree Vineyard malbec, Wahluke Slope, $48: Former Mercer and Ste. Michelle winemaker Jessica Munnell is making great reds under her own label. 20. Wilridge Winery 2015 Wilridge Vineyard Estate sagrantino, Naches Heights, $40: This big, rustic Italian red is rare, but Seattle winemaker Paul Beveridge is crafting a delicious example. 21. Wild Goose Vineyards and Winery 2016 pinot gris, Okanagan Valley, $17: I am becoming convinced that the best pinot gris comes from British Columbia, and this example does nothing to dissuade me. Available only in Canada. 22. Woodward Canyon 2014 Estate old vines cabernet sauvignon, Walla Walla Valley, $69: One of Washington’s classic cabs rarely disappoints, and this latest release is sturdy and will age beautifully. 23. Abeja 2014 cabernet sauvignon, Columbia Valley, $47: A top Walla Walla producer is crafting a superb cab well worth seeking out. 24. 14 Hands 2014 Stampede Red, Columbia Valley, $12: Count on the crew at this Prosser winery to craft stunning wines that are easy on the wallet, including this syrah-based blend. 25. Feather 2014 cabernet sauvignon, Columbia Valley, $65: Napa Valley winemaker Randy Dunn makes this remarkable red under the Long Shadows umbrella. 26. Spindrift Cellars 2015 pinot noir, Willamette Valley, $22: This small producer near Corvallis is crafting delicious, sturdy and affordable pinot noirs. 27. Cinder 2016 off-dry riesling, Snake River Valley, $18: Former Ste. Michelle winemaker Melanie Krause has taken her talents to her hometown of Boise, where she is making some of Idaho’s top wines. 28. Van Duzer Vineyards 2014 Westside Blocks Estate pinot noir, Willamette Valley, $60: This little winery near Salem is crafting pinots that are simply sublime. 29. Brian Carter Cellars 2013 Byzance, Columbia Valley, $38: Woodinville master blender Brian Carter has crafted a superb GSM-style Rhone red that combines spicy fruit with a silky mouth feel. 30. JoieFarm Winery 2015 En Famille riesling, Okanagan Valley, $28: This riesling from north of the border makes me swoon. Worth the hassle of an international order to obtain. 31. Reustle Prayer Rock Vineyards 2015 Revelation & Sorek Block Estate grüner veltliner, Umpqua Valley, $24: Roseburg winemaker Steve Reustle makes three grüners, and this is among the best you’ll find on the West Coast. 32. Canvasback 2014 Grand Passage cabernet sauvignon, Red Mountain, $80: The reserve-level cab from this Duckhorn brand is worth the investment. 33. Gehringer Brothers Estate Winery 2016 classic riesling, Okanagan Valley, $13: Oliver, B.C., winemaker Walter Gehringer crafts world-class rieslings that are a bargain. 34. 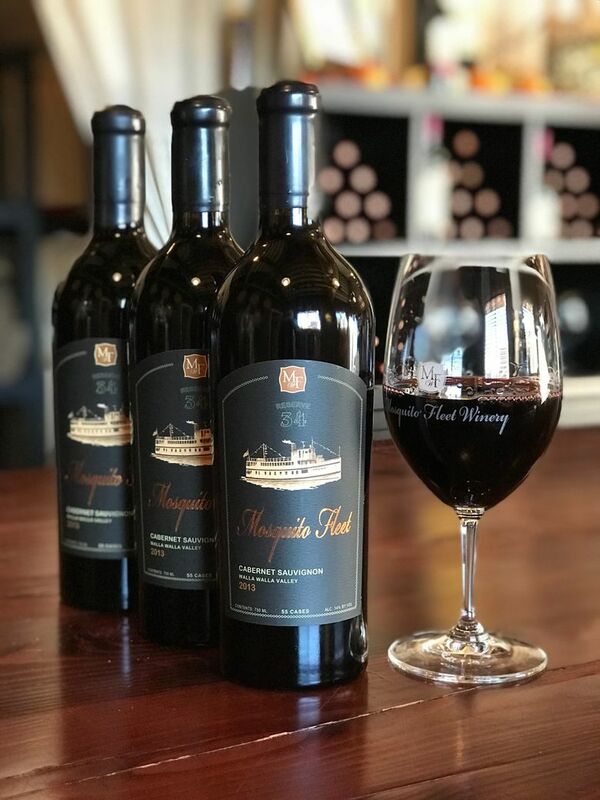 Maryhill Winery 2014 Proprietor’s Reserve grenache, Columbia Valley, $26: Goldendale winemaker Richard Batchelor is developing into one of the state’s top red winemakers, and this delicious grenache is a great example of what’s possible with this red Rhone grape. 35. Tightrope Winery 2015 pinot noir, Naramata Bench, $35: Penticton winemaker Lindsey O’Rourke is shooting up the ranks of top Okanagan producers, and the quality of this pinot is amazing. 36. Andrew Januik 2014 Stone Cairn, Red Mountain, $40: This cab from a top young Woodinville winemaker uses grapes from Ciel Du Cheval Vineyard, one of the oldest plantings on Red Mountain. 37. Upchurch Vineyard 2014 cabernet sauvignon, Red Mountain, $68: DeLille winemaker Chris Upchurch has launched his own brand using estate grapes, and these wines should be on a serious wine lovers’ to-do list. 38. Chateau Ste. Michelle 2016 chardonnay, Columbia Valley, $15: Our state’s oldest winery produces the most chardonnay, catching a wave of consumer interest with a deeply satisfying style. 39. Love That Red Winery 2016 Love That Rosé, Columbia Valley, $18: A stunning pink wine from this up-and-coming Woodinville producer. 40. Charles Smith Wines 2015 Kung Fu Girl riesling, Washington, $12: Large Seattle winery has been crafting this mouthwatering riesling for years. A great wine at a great price. 41. Lopez Island Vineyards 2015 estate grown organic madeleine angevine, Puget Sound, $25: I love this cool-climate variety, especially how well it works with shellfish. Well worth seeking out. 42. Avennia 2014 Boushey Vineyard Arnaut syrah, Yakima Valley, $50: Former DeLille winemaker Chris Peterson is producing cult-status wines at his Woodinville boutique operation. 43. Panther Creek Cellars 2014 Schindler Vineyard pinot noir, Eola-Amity Hills, $50: I think Oregon’s most interesting wines come from the Eola-Amity Hills, and this pinot from a top longtime winery further proves that point. 44. Col Solare 2014 cabernet sauvignon, Red Mountain, $75: The first estate cab from Col Solare shows a dynamic red that should only get more interesting with vine maturity. 45. Passing Time 2015 cabernet sauvignon, Columbia Valley, $50: Retired NFL quarterbacks Damon Huard and Dan Marino’s collaboration with Woodinville winemaker Chris Peterson continues to result in some of the most intriguing wines in the Northwest. 46. Pike Road Wines 2016 pinot gris, Willamette Valley $16: A sister brand for Oregon’s Elk Cove, this superb pinot gris is versatile with seafood and for casual sipping. 47. Abeja 2013 Heather Hill cabernet sauvignon, Walla Walla Valley, $68: This top vineyard near Seven Hills results in a magnificent red from a top Walla Walla producer. 48. Columbia Crest 2014 Walter Clore Private Reserve, Columbia Valley, $35: This Bordeaux blend honors the father of Washington wine and is among the best blends in the state. 49. Mercer Estates 2015 Sharp Sisters Red, Horse Heaven Hills, $25: This blend of Bordeaux and Rhone varieties is perfectly balanced for drinking now or hiding in the cellar. 50. Clearwater Canyon Cellars 2014 Coco’s Reserve malbec, Lewis-Clark Valley, $38: Though sold out, here is a red that dazzles the taste buds and boggles the mind with the possibilities of where Northwest malbec could soar.